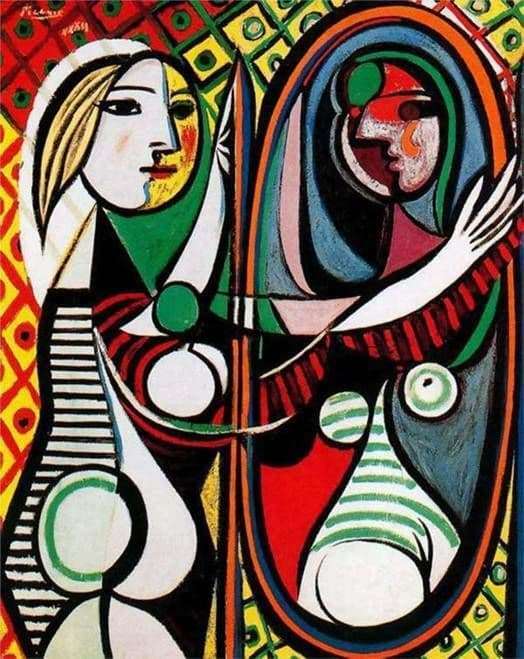 Picasso created a masterpiece in 1932. He depicted a mistress, whom he met back in 1927. Her name is Maria Theresa Walter. She became his muse. Walter is depicted very unusually. This is not an ordinary portrait. The artist tries to look at the girl in the mirror. The main motive of this work – the exact image is simply impossible to see in the mirror. In Picasso, it is interpreted differently. Each contour in the mirror acquires a special mystery. Just such a striking intensity of each color. Amazing background with such fancy patterns. The circular arcs in the foreground are fully balanced by the diagonal lines that we see in the background. The diamonds on the wallpaper are very similar to the costume of the beloved Picasso character – Harlequin. The artist considered himself to be like him. By this he specifically emphasized that he is present in the picture, watching everything that happens. The face is divided into completely different halves. One resembles a real mask made of wood, and the other half of the moon (a month). Light pink profile and blonde hair speak about the youth of the heroine. The face is incredibly similar to the crescent we are used to. Maria Teresa stretches her hands to the mirror, as if she wants to touch this unreal reflection. It attracts and scares. The whole entity in the mirror becomes different. Here is what is hidden inside. This is not available to the ordinary eye. Bright spots surround the reflection. The body seems in the mirror deliberately distorted. Opposing passions are fighting, and the viewer can see it. Maria Teresa was able to see her essence. The spot on the heroine’s forehead is a special treasury in which the whole inner life of Maria Theresa is hidden. Some researchers believe that Picasso points to the duality of the soul of Walter. But it is quite possible. That shy girl sees her negative traits that others prefer not to notice.